Running a successful franchise business through a kiosk format is picking up fast for various reasons. Besides it is being a low cost franchise opportunity, it is easy to start and manage as well. But does this mean that all franchise businesses run through a kiosk are a success? Well opinions can be varied. However, the most prominent factor that decides the fate of a kiosk franchise business is its location. For an aspiring entrepreneur who is keen on making a mark in franchising, taking a kiosk franchise can be a great idea. There are aspirants who opine that running a kiosk is not as profitable as having an outlet, as kiosk is small in size and thus draws limited clientele. No doubt the size of a kiosk is much smaller as compared to an outlet but if it is positioned at a strategic location it can do wonders for the entrepreneur. Moreover an entrepreneur can expand his business by running a chain of these franchised kiosks. Shopping malls: Mall is a best location to open a kiosk. It is huge in size and is a multi-storey building with scoop to have more than one kiosk at a single storey. Moreover shopping malls offer a complete package of entertainment food and shopping that lead to large footfall. All kind of kiosks including jewellery, watches, sunglasses etc. juice, coffee, chocolates, sweets and ice-cream can generate maximum profits here. Airports: Airports is also a good site for franchised kiosks from footfalls perspective. Franchise brands from categories of books, gifts, coffee, luxury brands, watches, jwellery and accessories are best suited here. Many travelers love to purchase souvenirs while on vacation. They also pick up stuff for their friends and family. Travelers roam around the airport as they have plenty of time waiting for their flights. In vicinity of big outlet: Starting a kiosk outside a popular restaurant or any other franchise store can also be considered an apt location. As mentioned kiosk do wonders in high footfall areas, therefore opening a kiosk near to popular outlets is a good idea. Having a franchised ice-cream kiosk near a big restaurant or hotel, an accessory kiosk near an apparel store or a games kiosk for kids can be great locations for starting a kiosk business. But a franchisee needs to take prior permission from his franchisor and the outlet owner before taking this step. 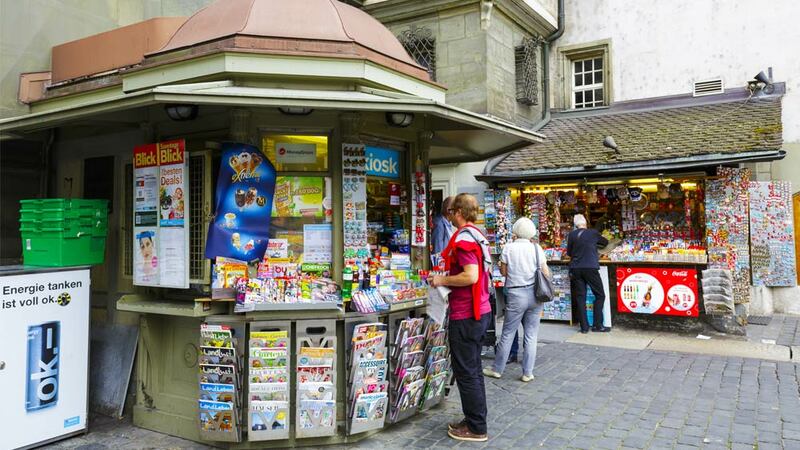 High-streets: Kiosk can also do well in high-streets but they should be so located that they fall in high foot-fall areas. Therefore opening a kiosk in a high-street near branded stores can be profitable. Hospitals: Considering the need and demand of medicines, tea-coffee and quick service food outlets in hospitals 24 x 7, large number of franchisors are exploring hospitals as apt locations to open kiosks. Patients, their relatives, doctors, hospital staff and visitors can be the prospective consumers to target. University Campuses: Educational institutes are also fast becoming a suitable location for kiosks especially for food, tea, coffee, juice, stationery, gifts and greetings. Students, professors, and administrative staff can be the prospective clients for such kiosks. Local fairs: Setting up a franchise kiosk in a local fair or during any festival is also a profitable idea. Thousands of visitors attend the local fairs. Instead of eating or buying from ordinary food stalls there, they would surely prefer if there is any branded food kiosk. However before deciding and venturing into this business it is always advisable to talk to the franchisors for their idea about a perfect location for their products/services. Entrepreneur can also visit the shopping malls and talk to current kiosk owners. Most of them shall be happy to enlighten you about profit margins and share the details of their lease. Lease or rent is an important consideration while opting for a location. Always negotiate on the prices quoted by the mall developers or other builders. Have a fair idea of where the kiosk will be placed in the mall or other sites before making the final payments. To conclude it can be rightly said that taking a kiosk franchise can surely put you on the success track but gaining and retaining success depends upon the location and on how well an entrepreneur can manage it. Business Barter Exchange, Greetings from Kiran! I would like take this opportunity to express my interest. i live in hyderabad. B y profession i'm an engineer. By choice i'm an entrepreneur, exposure into various domains. Looking forward for your valuable reply. Regards, Kiran.